My name is Sarah, and I am the writer for Jewelry Dose, Max & Chloe's blog. I am SO thrilled to be writing a guest blog on Scuttle. I have been a fan of Holly's for a while now, and I love pouring through her posts for her style tips, inside scoop of her travels and her absolutely beautiful pictures! 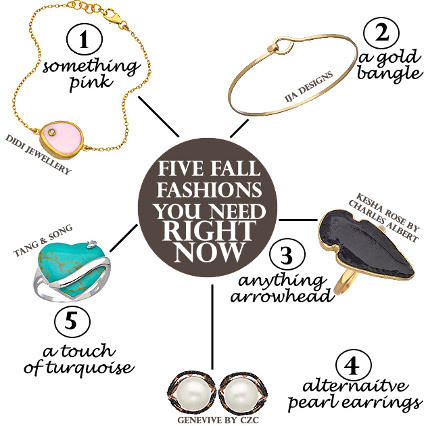 I decided to write about some new fall jewelry trends for my post, "Top 5 Fall Must-Haves" - I hope you enjoy reading it as much as I enjoyed writing it! 1) Something PINK. Get in touch with your feminine side this Fall and rock some lovely pink jewelry with your leather jacket and black booties. The contrasts are so hot. The lighter the pink the better. We're loving Didi Jewellery Gold Pink Opal and Topaz Starbright Bracelet. 2) A gold bangle. A gold bangle is the type of piece that – if you buy the right one – can last you a lifetime and is always in style. Favored by celebs like Zoe Saldana and Jennifer Lawrence, a gold bangle can be worn casually or to a fancy party, with a black maxi or a red cocktail dress. We're fans of Ija Designs Large Clasping Bangle Bracelet and Melinda Maria's Nailhead CZ Bangle. 3) Anything arrowhead. Arrowheads are one of those motifs in jewelry that are tough to pull off – but when you do, they steal the show. We like them because they're edgy and have a history behind them. Even Ke$ha digs them - Kesha Rose by Charles Albert Obsidian Arrowhead Meta Ring. 4) Alternative pearl earrings. Legendary Dutch painter Johannes Vermeer - who created the masterpiece "Girl with a Pearl Earring" - would wish he could start over if he saw the stunning alternative pearl earrings we have now. We're obsessed with these pearl earrings with a twist - like the Genevive by CZC Rose Gold Black and White CZ With Pearl Round Earrings - because they have that classic pearl touch but are incredibly contemporary, fun and versatile! Who doesn't love an update on an old classic? 5) A touch of turquoise. We adore turquoise this during Fall (and really all year round). Especially right now, as we transition from the season of the reality TV to the season of our favorite cable shows (final season of HIMYM! ), turquoise is one of those stones that aids the transition beautifully. Its brightness is perfect for the end of summer, and it's richness fits wonderfully for oncoming Fall festivities. We love Tang & Song’s Sterling Silver and Turquoise Heart Ring. Thanks again to Holly for being such a doll. Working with her was such a pleasure! For more jewelry goodness follow the Jewelry Dose blog and keep up with them on social media!